RIO DE JANEIRO – With the exploding oil industry following the pre-salt discovery, and playing host to the World Cup in 2014, and the Olympics in 2016, talk of the Rio boom is echoing around the world, especially in Real Estate circles. 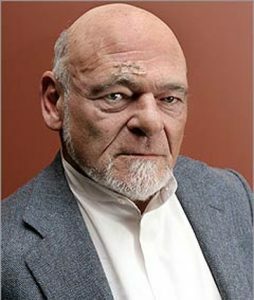 US billionaire and real estate investor Sam Zell predicts Brazil is the next big thing, photo courtesy of cfnews13/Creative Commons License. World property guru Sam Zell recently commented ‘If you look at all of the facts, I don’t think there is a better property environment in the entire world than Brazil,’ said Zell, who has also suggested that the country could surpass China in economic might in Thirty years. Accessing this market may seem daunting to foreigners though, especially those who don’t speak Portuguese. As a first step to getting familiar with the players, we’ve listed five top Real Estate companies here in Rio de Janeiro. The following appear to have the most current listings in Zona Sul (south zone), and claim to have agents fluent in English as Spanish. CEMA Inmobiliaria who has recently joined forces with Ana Claudia Imóveis in order to provide over 16 years of experience in serving clients in the Rio Zona Sul market. They have offices in Flamengo and Copacabana. Master Inmobiliaria is a young company that has only been in the market for two years. Master differentiated themselves through trying to dominate the online processes with an extensive web site that allows you to search properties as well as post and track your own listing. 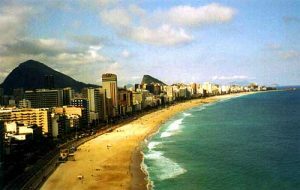 Leblon and Ipanema beach, photo courtesy of rioadventures/Creative Commons License. Julio Bogoricin is another well-established enterprise with visible offices spread around the Zona Sul area and over 50 years experience. Under their umbrella they offer condominium and administration services, and a brokerage house. They are based out of Rio de Janeiro with five offices, three of them in Zona Sul. Etica Inmobiliaria, with over 17,000 current listings throughout their 26 Brazilian branches, it is part of a much bigger holding company, Brazil Brokers. Etica has been in the Rio market for over 25 years and has five offices around the Zona Sul. APSA Inmobiliaria is another household name in Zona Sul, and across Brazil. Established in the Thirties, APSA is now proud to claim the largest Brazilian portfolio of Real Estate and Condominium management. With thirteen offices in Rio de Janeiro, an in house insurance broker as well as a Legal team APSA is well prepared and knowledgeable for all your Zona Sul real estate needs. With growing foreign interest in Rio de Janeiro, as well as the rest of the country, international agencies are planning growth in Brazil. Property specialist Colordarcy, based out of London has seen Brazilian property inquiries rise by 60 percent since the Olympic announcement. Whether national or international, always remember Real Estate is not a perfect science; get second opinions, do your research carefully, and demand the best service possible out of your Real Estate agent. in fact, why dont you try to sell you apartment? prices doubled, tripled, but where are the buyers? NO BUYERS….theres thousands of properties for sale in rio full os speculation prices. rio is pure speculation at this moment… theres no money in rio, from low to middle high class no one can afford to buy. people is only trying to sell sell sell, for prices most of the time more expensive then usa, australia and europe… rio real estate is low quality , and maintenance fees are just stupid. 500 usd a month 800 usd a month and the insanity goes on. in my opinion only crazy people will buy now and only smart people will sell now, cause everybody know in 6 years from now propertie prices will colapse. rio economy is not sustainable for the rio real estate prices and level of life…many things will change in the years to come before world cup and olimpics…starting with the currency real that is super hiper over apreciated and must colpase otherwise internal deficit of brasil will destroy the whole economy.